Inflexibility of the hamstring muscle is often a prominent kink in most people’s posterior kinetic chain. It’s the reason why we have to sit down to tie our shoes, can’t sit up-right with our legs straight out in front of us, and the reason why most of us would be very pathetic at martial arts. Having a tight hamstring is a major concern as it can lead to increased risk of injury, decrease athletic performance, and cause pain and symptoms both proximally and distally (low back pain, achilles pain, etc.). Chuck Norris doesn’t get posterior chain tightness. 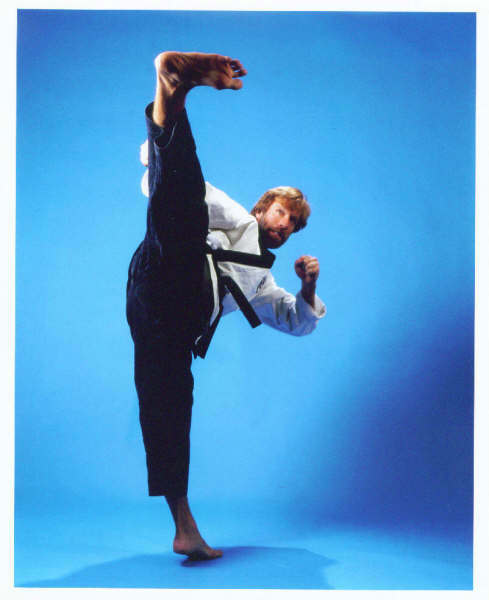 Chuck Norris gives posterior chain tightness. A possible cause of this common impairment could be that the majority of the population spends a substantial amount of their time in the seated position (jobs, communting, watching tv, reading this post, etc.). This seated position puts the hamstring in a shortened position. The body responds and adapts to this habitually shortened position by decreasing the hamstring muscle length. To further complicate the problem, hamstring tightness is not just a result of muscle tightness. Fascia and neural tension are a major component of posterior leg tightness. So how can we address all of these aspects of hamstring tightness without spending 30 minutes of stretching a night? This stretch will hit the entire posterior kinetic chain from your plantar fascia to your low back. It also works all 3 aspects of hamstring tightness (muscle, fascia, neural tension). Of course there are many other considerations when addressing hamstring tightness (posture, ergonomics, muscle weakness, compensations, etc.). But I hope this article will at least give you a new way to stretch your hamstring and posterior kinetic chain. Just taking a few minutes a day for this exercise can help improve your hamstring flexibility and possibly decrease your risk for injuries.